Coming soon to the growing and every popular Fleetwood Surrey real estate market place are the new pre-construction Surrey Monterosso Condos for sale conveniently situated at 8717 – 160th Street, Surrey. The Fleetwood Surrey neighbourhood is growing rapidly, with many amenities and communities services coming into town, making it one of the most liveable and up-and-coming neighbourhoods in this second largest city in the Lower Mainland. The pre-construction Surrey Monterosso Condos for sale will introduce a boutique 54 suite four storey low rise building with fantastic features designed to look great and go easy on the environment as well. To be built to Buillt Green BC and PowerSmart Gold standards for outstanding energy efficiency, these new Monterosso Surrey condos for sale will feature a crisp, contemporary look with gourmet kitchens, luxurious tiled baths/ensuite, quartz counter tops, plus a fun and funky amenities lounge with large screen television for homebuyers to enjoy year-round. Central location within Fleetwood means that homeowners at the new Monterosso Surrey condos or sale will be just minutes away from four large shopping centres, big box retailers, boutique shopping, dining options, parks, schools at all levels and transportation hubs. The presentation centre for the new Surrey Monterosso condo development is opening in early May 2010 at 8727 – 160th Street, Surrey. For more information about the pre-construction Surrey real estate development at The Monterosso Condos, please visit www.themonterosso.com today. SMART DESIGN and CHOICE LOCATION! Live. Shop. Dine. Play. Relax … It’s all here at the new Surrey Monterosso condos for sale. The perfect blend of sustainability and style, these 54 exceptionally crafted Monterosso Surrey condominium residences are conveniently located in the heart of the Fleetwood Surrey real estate market and are selling right now. Register now for the VIP Grand Opening for Monterosso Surrey pre-construction condo sales today by calling 604.596.8828 or visit www.monterossohomes.com for more information. These Built GREEN Surrey condos for sale at The Monterossos Fleetwood condominiums are located at a site address of 8727 – 160th, Street. Developed by the Pioneer Group and featuring the 2-5-10 home warranty. 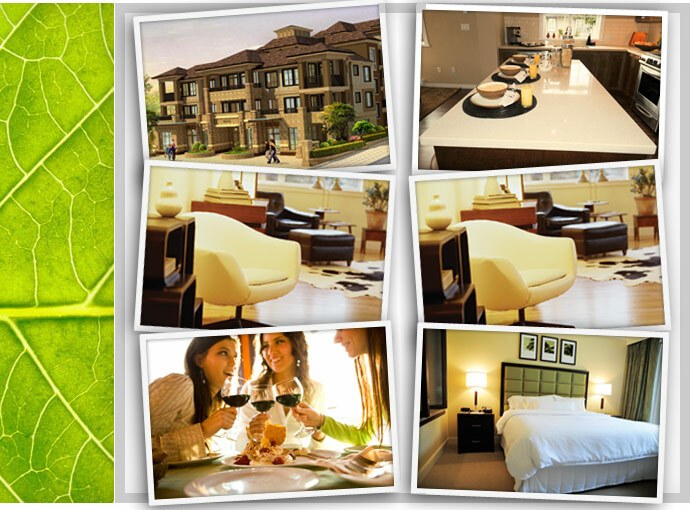 Built Green Surrey condos for sale are now here! The fifty four boutique Fleetwood Surrey condominiums at The Monterosso make up this exclusive enclave of high-end apartment residences that will change the property market in this neighbourhood forever. The Fleetwood South enviable Surrey real estate neighbourhood is the home for The Monterosso condos and features 3 distinct selling bonuses: SMART Design where you have spacious floor plans for both inside and outdoor living. Secondly, the Monterosso Surrey condos for sale in Fleetwood South is a choice location that is close to everything, so you can leave your car at home if you wish. Also, homebuyers know what they’re getting in this Built Green Surrey condo development where the Monterosso Fleetwood condominiums are friendly to the environment and neighbourhood in which you call home. These are three very important features that The Pioneer Group has thought of and incorporated into these new Fleetwood Surrey Monterosso condominiums for sale. Althoug the Monterosso floor plans and features lists are coming soon, what we do know about this boutique Fleetwood Surrey condo project is that there is no wasted space in these functional layouts and that the finishes are premier and rival the best developments in the Lower Mainland. Designed by Portico Design Group (award winning and local), the new Monterosso Surrey condos will feature such things as scratch resistant quartz counters, undermount sinks, laminate plank hardwood flooring and fully tiled bathrooms. In addition, the Built Green features of the Surrey condos here at the Monterosso Fleetwood condominiums cannot be overlooked by homebuyers. From improved energy and water efficiency to appliances that have Power Smart Gold rating and mch more, the environmentally friendly Monterosso Surrey condominiums will help you protect your own community for generations to come. Opening its presentation centre doors on May 29th, The Monterosso is a new Surrey real estate development in the ever changing Fleetwood neighbourhood. This choice location amongst first time homebuyers and families is the site of the newest Built Green surrey condo building called The Monterosso Condos and will be located at 8727 160th Street, Surrey. The Pioneer Group of Companies is the developer behind the new Surrey Monterosso Fleetwood apartments for sale and they are excited to bring a new Built Green condominium project to the market place that features modern design, great curb appeal and fine interior craftsmanship. With over thirty years of experience, the Pioneer Group of Companies specializes in both townhouse and condo developments. Here at The Monterosso Surrey Fleetwood condos for sale, homebuyers will find an exlcusive collection of only 54 condominiums that have high end features including quartz counters, gourmet kitchens, under mount sinks, luxurious tiled baths, and oversized outdoor living space. In addition, the new Fleetwood Surrey Monterosso condos will feature a great amenities clubhouse lounge with large screen television and a foosball and air hockey table. One of the stand out features of the Monterosso Surrey condos is that this is a Built Green condo buiding which means that homebuyers will protect their environment in addition to saving on energy and water bills. Some of the great Built Green Surrey condo features here at the Fleetwood Monterosso building includes Low VOC paints, low VOC carpets, Energy Star appliances and recycling centres. In addition, the convenient Fleetwood Surrey location makes it easy for residents to walk to school, banks, shops, restaurants, parks and local services. For more information about the pre-construction Surrey condo launch of The Monterosso, please visit monterossohomes.com or call 604.596.8828 today. Fresh urban condos in the heart of Fleetwood Surrey real estate district are now starting from just $169,900! A limited collection of sustainably Surrey Built Green condos are now being offered at The Monterosso condos for sale which are located in the up and coming Fleetwood revitalized neighbourhood. From quality finishes to gourmet kitchens and from spa inspired bathrooms ensuites to open conept floor plans, the Monterosso Surrey Built Green condos are a level above the rest but at an affordable price point starting from the high one hundred thousand dollar range! The smart designs and Built Green Surrey condo features at The Monterosso are great selling features for both first time homebuyers as well as upsizers looking for more space but at affordable pricing. The Pioneer Group brings to the Fleetwood Surrey real estate market a collection of Built Green Monterosso condominiums that follow the success of The Vernazza a few years back. There are two colour palettes for homebuyers to choose from that include Espresso or Latte and botht the kitchens and bathrooms are amazingly finished with quartz counters. The fixtures are high-end and the kitchens are amazing. The functional floor plans also do away with space wasting hallways, and the Built Green Surrey Monterosso condos for sale have expansive and covered balconies for lower maintenance. There is also a hotel clubhouse area with lounge areas, air hockey and foosball in addition to a mini fridge and large TV for you to socialize and meet your neighbours. The Power Smart and Built Green features of the new Fleetwood Surrey Monterosso condos will result in lower energy and water consumption, thereby saving home owners lots of money over the short and long term. Dual flush toilets, front loading washer and dryers, Energy Star rated kitchen appliances, low flow water fixtures and low VOC paints result in better and healthier living spaces for residents at the new Monterosso Surrey Built Green condos for sale. For your piece of mind, the Monterosso apartments feature rain screen technology and Umbrella Architecture which shield the interiors from external elements. All homes sold at the Monterosso Surrey condos will come with the 2-5-10 Warranty Coverage from Travelers. Building luxury and boutique homes since 1978, The Pioneer Group brings their expertise to the Fleetwood Surrey real esate market place through the launch and construction of The Monterosso condominiums. Georgie Award winning designers, architects and builders here at The Pioneer Group will ensure that Monterosso condo buyers will get the best value for their money through quality craftsmanship, innovative design and superior customer service. In addition, The Pioneer Group is Built GREEN Certified Builder, as seen through the plans of the Built Green Surrey Monterosso condo project. For more information and to join the sales team at the VIP Grand Opening for the Monterosso Surrey condo project, please register your interest online. The address is at 8727 160 St, Surrey, BC and the sales centre for The Monterosso Surrey pre-construction condos for sale will be opening in mid May 2010. The Fleetwood South Surrey real estate neighbourhood is truly amazing. You will be just steps away from the Fleetwood Community Centre in addition to numerous fitness gyms that include the Surrey Sport and Leisure Complex, Bikram Yoga, She’s Fit and many more. Also close by the Monterosso Surrey Fleetwood South condos are numerous golf courses that include Eaglequest Coyote Creek, Guildford Golf & Country Club and the Surrey Golf Club headquarters. In addition, as homebuyers at the Fleetwood Surrey Monterosso condos, you will be minutes away from the huge Guildford Town Centre, Fruiticana, Save on Foods, Two EE’s Farm and Marketplace IGA in addition to numerous schools and local services. Conveniently located in the heart of the new Fleetwood Surrey real estate community, the Monterosso boutique condos for sale will feature an exclusive low-rise (four storey) residential building featuring only 54 suites. These PowerSmart Gold rated and Built GREEN BC certified Surrey condos at The Monterosso Fleetwood real estate market are beyond anything you have ever seen. Outstanding energy and water efficiency is to the homebuyers’ benefit both short and long term. Not only that, but the modern and contemporary interiors of the pre-construction Surrey Monterosso Fleetwood condos will feature gourmet kitchens, luxurious tiled bathrooms, quartz countertops, plus a fun and funky amenities lounge. Not only that, you are centrally located in Fleetwood Surrey real estate market so the Monterosso homebuyers will be within walking distance or short drive away from all the shopping, parks, schools (many levels) and public transportation that make this neighbourhood so liveable and sustainable now. The presentation centre for the Monterosso Surrey condos will be opening May 2010, so please pre-register to gain VIP preview access before the general public grand opening of pre-sales.